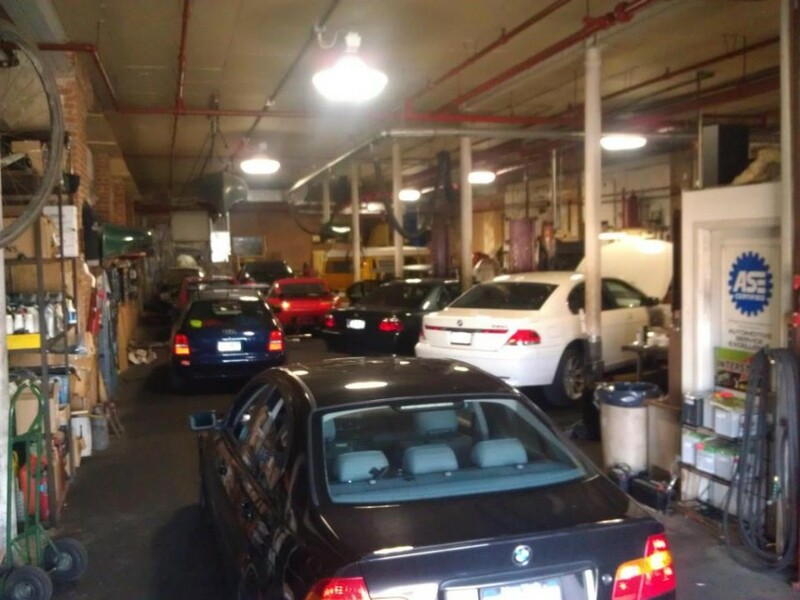 The home of BMWCCA New York Chapter's tech advisor! I came here desperate because the BMW dealer was giving me a price to fix my car that was practically the value of the car. The car is a great car and so cute and I was not ready to part with it or start a new car payment. I found out that BMW will replace a main piece, instead of repairing the component inside of the main piece. EuroMeccanica looks at the intricate parts, to fix what is really wrong, instead replacing pieces that are perfectly good. It still was a pretty penny, but way less then the value of my car, which allows me to still drive in it, and get a new car when I'm ready, not because I have to. I called him told him I needed work, and I tried to get a estimate he told me to come in sure we can fix it. I let him know the car is overheating and I don't want to waste my time coming with it. The next day my parts came and I went over to see him, he came outside looked at my car and base on the sound I assume he said yup it needs a water pump. (so why did I need to come there for what exactly ?) I asked him how long he says half a day like a water pump/Tstat will take half a day?? I'm shocked I said really everywhere else quotes me 2 hours. He literally turns around and walk back in the shop without acknowledging after he made me drive all the way over to the shop. I went in the shop I said can I get a quote he said there really isn't a quote. How much u charge a hour and how long will it take simple. $100/h for a hours ok $250 how hard is that? 3/30/16 First experience with EuroMeccanica was that a great, knowledgeable cohesive group of technicians who have excellent technical skills and people interface. I had a AFE cold air intake box installed by Alan (great tech along with Pops and Michael overseeing all aspects of every job) for a little more "gitty up" in my beloved "08 328 XI. I would highly recommend this Indie shop for quality, personable work performed by a real close group of guys. I definitely will be returning for future work/upgrades. Thanks, fellas! I'm a big DIY guy and have made DIY guides of vanos disassembly and rod bearings. However, when I have to take one of my cars to a mechanic it is always Mike (the shop owner). My experiences with mechanics are generally bad, as they try to blow smoke about what's wrong, etc. EuroMeccanica is impeccable and when I have an issue I don't want to DIY I come here. Great indie shop. They know their stuff. After reading all the above reviews I figured I would try them out. Brought my 02' M5 here which needed new power steering hoses, new gasket seals and new vapor seal on rear door. They did the job faster (BMW took 6 days just to diagnose my car) and for a 1/2 the price BMW would have charged. Great bunch of guys, knowledgeable, highly recommend EuroMeccanica. Now I need to leave my review because these guys deserve it. Thank you very much for your great work! As you are aware, BMW stands for "Break My Wallet" when it comes to repairs both minor and major; furthermore, finding a competent mechanic who takes the time to explain to you what has to be done in a way you can understand - is a rare find. Search no more - meet Mike Shiffer and his crew at EuroMeccanica in Mt Vernon. I had a problem with the top of my BMW Z4 top not going all the way down and while I had a fair idea of what the problem was and even researched the parts and cost of the repair - it took Mike's experience to do the job cheaper than all the BMW dealers and their service managers predicted. Henceforth, I'm taking my Z4 to him for any repairs and would advise you to do the same; and while you are there say hello to Pops, a fellow Latino and equally knowledgeable technician. My car is a 1973 2002 with an S-14 motor. Euromeccanica was able to fix multiple issues on a non stock car in creative and sound ways. I highly recommend them whether your car is stock or not. My car wasn't starting after been park for long hours. I took it to the BMW dealer and was told what the problem was, but the dealer was charging an arm and leg. My friend recommended EuroMeccanica. I called them and spoke to Mike. To make a long story short. Mike did a second diagnostic and realized that the dealer diagnostic was correct. Mike did a terrific job and my car feels brand new after the work performed. The first time I went to Michael was when I got my car out of another shop that made me buy an ECM and could not even program it. This guy kept my car for a week and could not program the computer and gave me every kind of excuse. Got fed up towed the car to Michael. He programmed the computer same soon as brought the car. Any ways the car did not start and had to leave it there. Next day Micheal found out the car needed a new starter. I got even more upset because I felt tricked by the first shop that had the car. Felt like they made me buy a computer I did not even need ( my words not Micheals). Any ways the next day picked up my car from Micheal. He is honest, and reasonable. Compared to the dealership or any other shop I have tried. He knows his job. If you want to get it fixed right go to Michael. I trust this guy with my car because I know am paying to get the right issue fixed on my car always. Thanks Micheal. I've worked on my 4 BMWs on my own for the past 8 years because I can't stand 'snake salesmen' at dealerships. However, when I had an issue I could not solve on my own I resorted to bimmershops to find a competent shop. Mike being the BMWCCA master tech should tell everyone what you need to know: this guy knows his stuff! I would definitely use EuroMeccanica again, what a great shop! Fair prices and above all, knowledgeable staff! Surfing the internet for a bmw mecanic i stumble on this shop,after i read the revews decided to take my bmw x3 for a cover gasket change ,mike was very nice and repair my car ,after i paid an arm and a leg i drove away,a month latter my gasket start leaking again,i did take my car back again after they inspected they say that was another gasket that was leaking ,lol ,it was the same gasket leaking .Mike ofer to repair my car for 400 on the top what i had paid a month earlier,by the way i found that my left shok was mising a bolt ,mister Mike fixit for me for 30 charge . So my frends this is my experience with this guys ,Good luck when you go in .Never again . Mike at EuroMeccanica helped me out greatly when I recently needed service on my 05 M3 ZCP. He performed an honest inspection of my vehicle and only quoted me with repairs that were 100% necessary. No ugly add-ons that other shops might try and tack on. He was very knowledge and provided me with an excellent level of customer service that is very difficult to find in this day and age. Mike is a man of his word and truly cares about the customers he serves. A+++ in my book! Mike Shiffer has been very helpfull in helping me solve a problem with my 1994 BMW. He took time from his schedule to walk me through a problem I had & led me in the right direction. I solved the problem, thanks to Mike, and would recommend EuroMeccanica to anyone who needs repairs. Thanks Again, Mike. Richie, Yonkers N.Y.
Mike Shiffer at EuroMeccanica is one of those rare automobile technicians who exudes trustworthiness. He actually cares about his customer's needs. He has given me his honest opinions about what improvements were worthwhile to have done on my car for track days and what modifications were wastes of money because he is willing to let his honesty and reputation build a long-term relationship with his customers even at the sacrifice of short-term sales. He is my go-to guy for all my BMW needs. Mike Schiffer is the best foreign car mechanic I have ever used. He is honest and trust worthy. He explains things in laymans terms so I can easily understand what my options are. He does only requested work and always consults me if there is repair work he would advise doing immediately and what work can wait. He asks me questions that let him know what is going on with my E30 M3 and what I expect the results of the repairs to be. Service at Euromeccanica, Inc. is excellent. I would not hesitate to refer anyone to Mike at EuroMeccanica. He needs to open a shop in White Plains too. This is one of the best BMW independent shops I have ever encountered in the NY area. Mike Shiffer is a superb technician with race bred skills and diagnostic know how; and also a nice guy. He never does work unless it is absolutely needed and advises you if he thinks you are wasting your money. EuroMeccanica's work is excellent. I have been servicing my Bimmer there exclusively since the early 90s. Mike has identified and corrected numerous safety issues and corrected them--one's that less saavy techs likely would have missed. If Mike was a heart surgeon, he would be the guy I would go to.